Below are current listings for single family homes in the Upper Valley region of New Hampshire and Vermont. 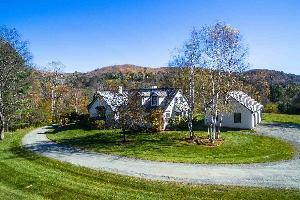 Contact us if you are interested in touring one of the Upper Valley luxury homes below. To receive updates on this listing or your other favorite homes, you can sign up with our website. Country home on 10.4 acres; Peaceful country location to support many outdoor activities. There' also a mobile home on the property for in-law or 2nd income potential. House needs rehab. but could become a great country retreat! LOVE TO ENTERTAIN-This is the home for you!! A great Tri-Level home that sits on a 2.54 corner lot in a country setting, yet close to town and minutes to Route 120 or I-91 for a commute to the Upper Valley. This unique home has so very much to offer. The sun-filled living room has a cathedral ceiling, beautiful hardwood floors and opens up to the second level, making it feel very spacious and bright. The vintage kitchen is quite unique with the matching appliances and a sweet dining area. Relax or entertain family/friends in the very spacious family room with as gas stove. This light filled room overlooks the large corner lot, with a golf green and the babbling Stevens Brook running along the edge. A sunken room off of the family area offers a bonus space for a game room, work-out space or an office nook. You decide!! There is more-A large Party Room complete with a wet bar, a dance floor, and the original ice cream fountain, counter top w/stools from Dodge's Pharmacy once located in the Corner Book Shop space on the corner of Tremont Square/Pleasant Street. You can own a little piece of history! A large storage area has garage door openings to store toys, equipment, a workshop and much more. A large breezeway connecting the home and two car garage is a perfect three season spot with plenty of room to sit and relax on or enjoy a meal, as it is right off of the kitchen. The garage has a nice workshop on the backside. A must see, one of a kind house! Create your own style!! Totally remodeled home is new from top to bottom, bamboo floors, new appliances, new roof, new siding, new heating system and central vac. Jacuzzi tub with separate large step in shower. Open kitchen/dining space. Every room equipped with cable including the bath. Only one mile from Rte 12A, so convenient for your commute in any direction. Over an acre and half of lovely field leading to a quiet remote spot on the brook. Plant your gardens, fence it in for kids or animals, build a volleyball area, and horseshoe pit for your fun summer bar-b-q's. Brand new drilled well with 50 gallons per minute. Plenty of space to build your own garage. Super Spacious 3 bedroom 3 bath Wilder home! This unassuming colonial home with gambrel roof line has more than meets the eye. Freshly updated with stainless steel appliances and granite in the kitchen. Tons of beautiful wood cabinets and oversized pantry for optimal storage capacity. Large heated, tiled mudroom / entry area . Choose to view your sporting events or Netflix in a Generously sized Family room OR the living room. Option for single level living exists with this home as there is a bedroom suite ,full bath , and laundry all on the main level of this wonderful home. Home is heated by a top quality Buderus Logano G115 furnace. Large back yard with a great sledding hill for the kids. Don't miss out on this lovely ready to move into, home! All by yourself but,... close to everything. Beautiful views of Shaker Mt and seasonal view of lake Mascoma. This raised ranch is has lots to offer, new hardwood flooring, newly painted 1st floor, 24 X 26 fully glassed in covered sun porch for entertaining many quest. Open concept living & dining room with long range views and sunny exposure. Attached 2 car garage and stone patio too. Lots of landscaping on a mostly open 3 acre lot. Priced to sell at $229,900. Cozy log home located in Quechee, VT. Nice private location with close proximity to town. Part of a small association with shared owner ship of both wooded acres and rolling fields. There is also a pond for your recreational uses. Set up for year around living, but would also make a nice getaway. Enjoy the woodstove and the views of Ascutney from the deck. Not part of QLLA. Subject to Right of First Refusal. This is one crazy opportunity for the right person. What we have here is a professionally renovated antique barn. This barn could be used as a barn, singe family, or up to 4 units residential apartments. Amenities include drive under parking (a lot of it) New Anderson Windows, new doors, new standing seam roof, new siding, new Buderus boiler, new drilled well, new 4 unit septic system. The lot is relatively flat and runs along the river. This is a clean property and ready for your ideas!